My overall impression of Mawlamyine Christian Leprosy Hospital (MCLH) was one of peacefulness. The wards were fairly full with long term patients with many of the same issues as those at Purulia but there didn’t seem to be as much urgency with how they were being treated. Perhaps the holiday period that had just passed meant that there weren’t any new patients requiring assessment etc. I think that all the travelling has finally caught up with me and I have felt really tired for the last few days but now I am on the way home, writing this in bits and pieces in Yangon and Dubai airports. Mawlamyine is one of, I think, only 2 specialist leprosy hospitals in the whole country and while only a minority of its patients are affected by leprosy it is vital that it is able to provide the specialist care that it does – without it I shudder to think how bad the levels of disability, deformity and Reaction might be. An increasing number of the patients are referred here by other leprosy organisations and NGOs rather than being diagnosed at MCLH. 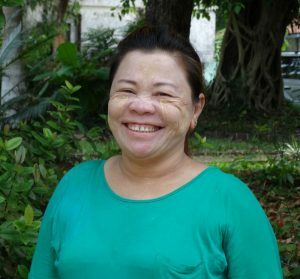 My main tour guide round the hospital was the nursing matron, Ni Ni Thein, who was a joy to spend time with and was an excellent translator both of what was said and of the local culture and patients’ expectations of the hospital and themselves. 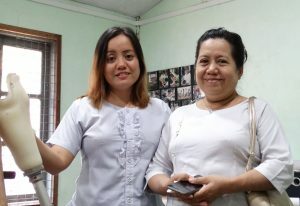 Her daughter, Zin Lynn Htaik Aung, also works in the hospital as a physiotherapist and manages the small prosthetic workshop which she is almost single-handedly modernising. With their skills and experiences both mother and daughter must have many job opportunities available to them but they choose to be here to serve God with the skills that He has given them. Between local holidays and fixed bus and flight timetables my time here was once again far too short – one day, on one of these trips I’ll manage to spend enough time in these amazing places to really do them justice. One of the people I met here was Tin Tin Moe. She was diagnosed with leprosy as a teenager and was treated at MCLH for years. She got married to one of the other patients, started a family, joined the staff team at the hospital and now can watch her children making their way through school, going to University and getting good jobs, unaffected by the stigma of leprosy because of the impact of the gifts and prayers of thousands of people over the years allowing MCLH to have the impact that it has had. Looking back on my whole trip, I see the amazing way that God uses the different parts of the mission to achieve His purpose of bringing love and care to outcast and desperate people. And that every part of this body, The Leprosy Mission, is necessarily dependent on the others. Speaking to many of you at meetings around the country I know that it is stories of people like the gardeners at Bankura Snehalaya; Sujata, and all the other students at Bankura VTC; the doctors and patients at Purulia; and people like Tin Tin Moe here at Mawlamyine that inspire you to stand in the G.A.P. for people affected by leprosy. Your support, your gifts and prayers make it possible for more people to be treated for their leprosy and to be supported to overcome the many challenges that can result from it and their stories, in turn, will inspire others until together we defeat leprosy completely. Thank you for all your support for people affected by leprosy and for the Likes etc of previous blog posts from my trip. I’m about to catch the last of the 7 flights that have made up this trip before taking a couple of days off to recover before getting back to the office to do all I can to help the amazing people I’ve met these past couple of weeks.